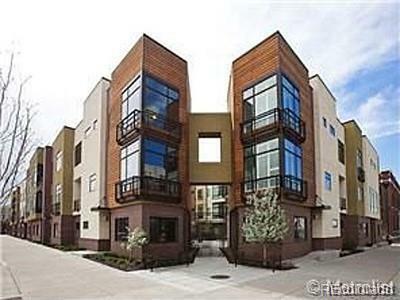 DOWNTOWN/RINO & MOUNTAIN VIEWS! PRIVATE ROOFTOP WITH CUSTOM DECK & HOTTUB! TWO CAR GARAGE! FLOOR TO CEILING WINDOWS! PRIVATE GATEDCOURTYARD! LOW HOAS! yes, yes, yes! This is the one you have been waiting for! Light filled hip townhome - fabulous rooftop deck giving you 600 additional sqft of livingspace, with hot tub, custom decking and panoramic city and mountain views - not to mention front door seats to the Rockies' Fireworks displays! Beautiful, luxe contemporaryfinishes - granite, SS appliances, hardwood floors, Berloni cabinets and more. All new double pane windows throughout! Gas fireplace, open and spacious great room layoutwith dining area, living room and balcony on the 2nd floor. Ensuite master bedroom with river rock shower floor and 2nd bedroom/bath on the 3rd floor that can be used as anoffice with views of the mountains from your private balcony. Two car attached garage with optional third space! Come see it before it's gone!